The DMP position finders are opto-electronic sensors that are used for fine positioning that is accurate to the millimeter. 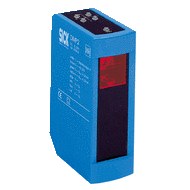 This sensor product family is primarily used in storage and conveying, where reliability, speed, and precision are the order of the day. Fine positioning is performed on the x and y axes with working ranges spanning 200 mm up to 2,000 mm depending on the type of device.